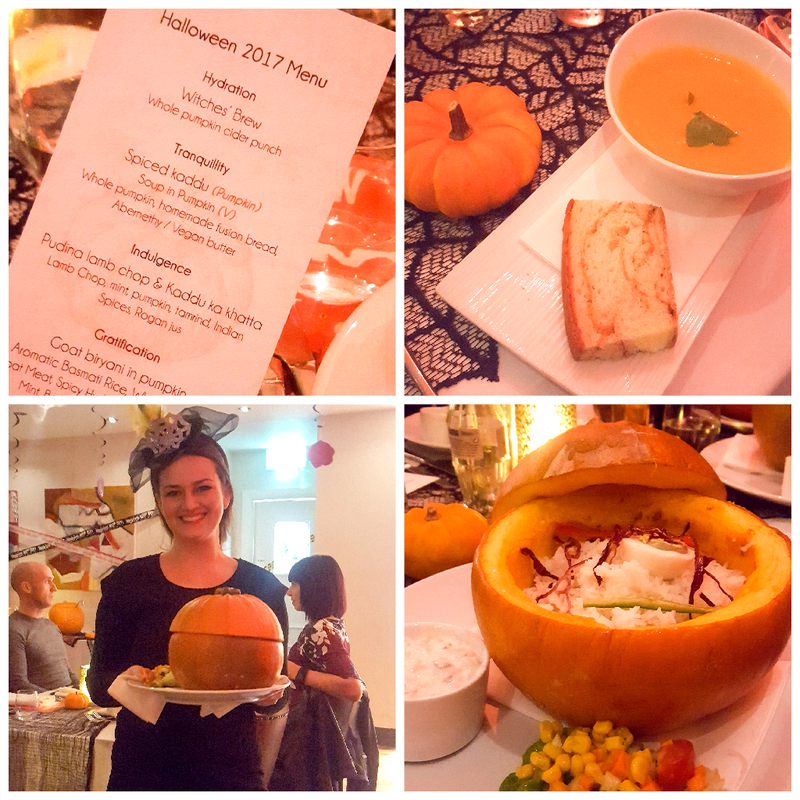 I dug deep into the depths of my Halloween costume cupboard on Friday 13th, threw on one of my favourite get-ups (in a pub car park, like the classy bird I am) and popped along with a few other local bloggers to test out new 2017 Halloween set menu. Souls Restaurant pride themselves with an approach and methodology that has never been attempted in Belfast before and specialise in modern Indian cuisine influenced by local preferences, ingredients and healthy cooking. The set Halloween menu includes witches' brew, spiced pumpkin soup with homemade fusion bread, a lamb chop with mint served with pumpkin and Indian spices. A Goat Biryani, served in a pumpkin and topped off with some eerie, jelly eyeball desserts. I love trying out new dishes so this menu really got me excited and intrigued. Sadly I only grabbed a few quick snaps on the night as I got a little over excited with having my dinner served in a pumpkin & accidentally rubbing off my bright green nose so please excuse these terrible photos and take my word for it. We started off with the spiced pumpkin soup and homemade fusion bread (served with witches brew- cinnamon spiced cider for the lucky non-drivers) which was well received. It was a really rainy and miserable night outside and the perfectly balanced spices in the soup really hit the right spot. Followed up by our second course - A Pudina Lamb Chop served with pumpkin cooked with mint, tamarind, Indian spices and Rogan jus. I'll admit it right now, I'm not a lamb lover at all and was a little weary of this course. The dish was beautifully presented, my chop looked more like a miniature T-bone steak to be honest. The meat was beautifully tender and the pumpkin accompaniment was a little sweet and spicy surprise. Now, by this point I was starting to wonder if I could swap outfits with the lady next to me dressed as an inflatable pumpkin as I had made the mistake of wearing very snug jeans and underestimated the sheer amount of food we were being presented with. The star of the show, our Goat Biryani was served IN A FULL FAMILY-SIZED PUMPKIN. I'm not joking here folks, I've never been so happy to pop that extra button on my jeans and make room for more food as this dish was outstanding. Goat Biryani, served in a full(cooked) pumpkin which was also therefore edible. Served with aromatic basmati rice, boiled egg and crispy vegetables on-top and a cucumber raita on the side to cool and refresh the taste-buds. Goat is a meat I'd never had the chance to try before but it's now firmly on my "do again" list. With the texture of very slow cooked beef and a flavour all of it's very own, this is just simply a dish that you need to try for yourself. If you are smarter than me and remember to wear your stretchy pants then you'll be able to take advantage of the dessert - A bloody eyeball. Don't worry though, it's a delight. A vanilla panna cotta, drenched in a blood red syrup was the perfectly sweet end to the menu. The Halloween menu runs from Thursday 26th October - Wednesday 1st November and if you'd like to pop along and test it out for yourself, you can book a table via their website: https://www.soulsrestaurant.co.uk or check out their special offers here The set menu is priced at £44.50 per person or £58.50 with wine pairing. I kinda want to try goat now! Sounds so tasty, loving the photos too! Thanks Anika. It was stunning. They have such a wonderful approach to ingredients too.! !